The Tallahassee Garden Center was built in 1848 for Henry Rutgers (City Councilman and Territorial Treasurer, 1842-1844) by George Proctor, a free black who built many of the early Tallahassee homes. The doors and woodwork are mahogany. Most of the other lumber is hand-hewn from native trees. Bricks came from a local kiln. Located in the Gold District, the property stretched from McDaniel Street and Meridian Road to the present half- city block. The grounds originally contained a smokehouse, an outdoor kitchen and a large carriage house. It also included pastureland for livestock. 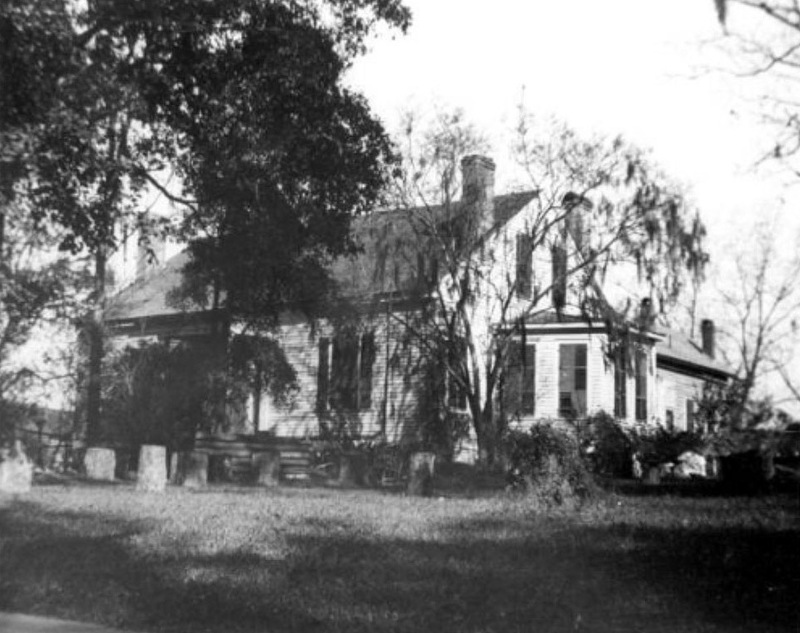 In 1889, following the death of Henry Rutgers’ wife Jane, Henry’s niece and her husband, Clementine and Edward LeRoy inherited the house. The Leroys sold the house to Erastus W. Clark in 1893 and, upon his death, his daughters Janie Clark and Minnie Clark Spears inherited the house. Upon the death of the latter, it became the property of The Salvation Army. The house’s architectural style, “double-pile center hall plan with “tripartite” front windows, is unique in Tallahassee. Two rooms were added in the late 1800’s. A porch on each side lined the back walk. An indoor kitchen and wainscoting were added in 1926. Using a parterre garden design popular in the 1800’s, the grounds follows a landscape plan that includes beds lined with boxwood. Crepe myrtle and southern magnolia define entrance ways. 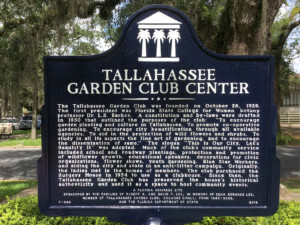 In 1954 the Tallahassee Garden Club purchased the property for its club house and continue to make updates and improvements while preserving the property’s historical authenticity. In 1969 a restoration project was undertaken that included enlarging the original auditorium to accommodate 100 people, adding a stage and installing central heat and air. In 1987 the Arvah Hopkins Patio was added. 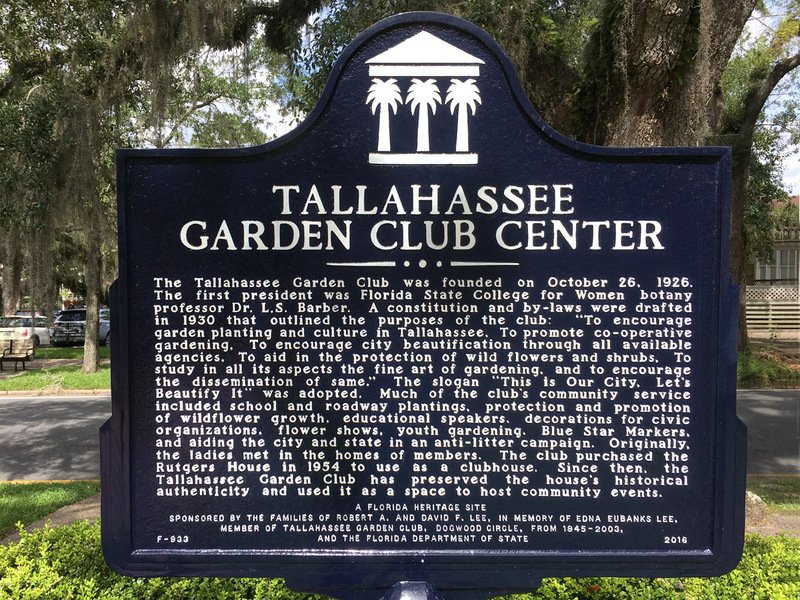 In 2015, a gazebo was added to the south lawn in memory of Jane Price, past president of the Tallahassee Garden Club. In June of 2016, the kitchen and trophy room powder room were completely renovated. Both obtained 21st century updates while retaining the integrity of the historic significance of the house itself. Additionally, a garden shed was added to house gardening tools and other gardening needs. Gifts from Circles, individuals and memorials have provided many lovely furnishings. 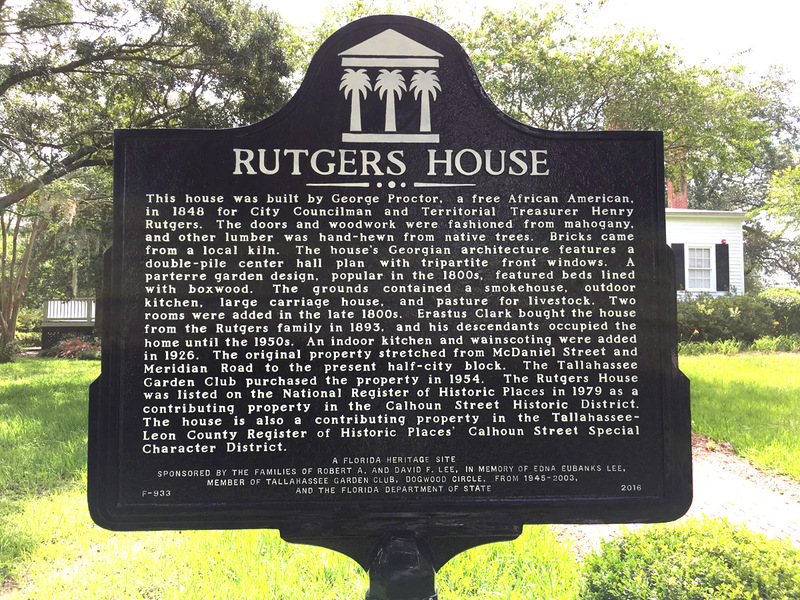 In 2017, an historical marker was installed on the front lawn denoting the significance of the property and of the club to the history of our region and our state. Known as The Rutgers House, the Garden Center provides a central location for club and community activities. Circles use the Center for their meetings, workshops, flower shows, and special events. It is also available for rent for all types of private functions including retirement parties, memorial services, weddings, receptions, business meetings and special celebrations. The arrangement of the rooms makes it possible for more than one activity to take place simultaneously. In addition to the auditorium, there is a large parlor, dining room, modern kitchen, trophy room which displays awards and historic items, and a sunroom. A large attic is perfect for storing equipment and flower show materials. An ample parking area permits the Center to be used for large teas, receptions or community activities.